Continuing the musical theme from last post, in the words of Johnny Cash: “How high’s the water, Mama? 5 feet high and rising.” But to be more precise, it is 34 feet (10.4 m as we write, at 10 o’clock on Tuesday morning) and rising, which is pretty bloody scary. 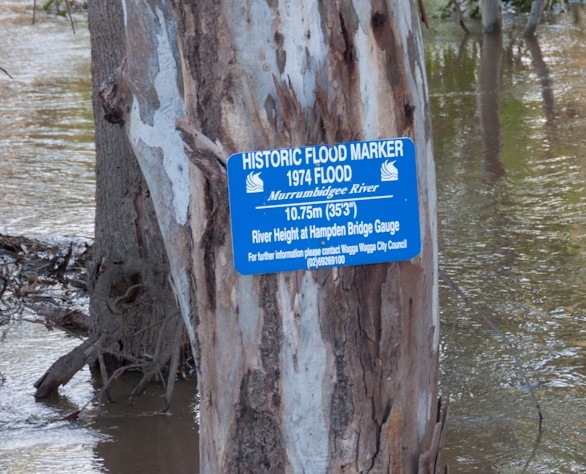 This photo is from the December 2010 flood, showing how high the water was then and its record peak in 1974. They are predicting a higher level this year. Some stats: at Wagga, the Murrumbidgee is normally around 2 m deep. The minor flooding level of 7.3 m was reached at 6 pm on Saturday. The moderate flooding level of 9 m was reached Sunday night at about 9:30. The major flood level of 9.6 m happened at about 10 am on Monday morning. 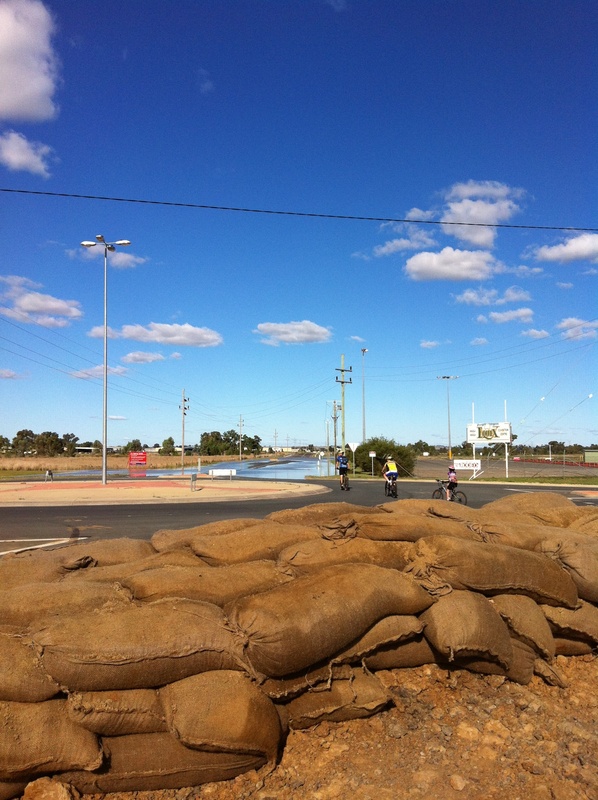 At this level, much of North Wagga – the area of the city north of the river – is under water and cut off. It was evacuated over the weekend, with most people and their pets and livestock having left. But it is still pretty devastating for people who live there, to see their property covered in several feet of muddy water. But now, the New South Wales State Emergency Service (NSWSES) is predicting that the peak will happen in the next few hours at 10.9 m. And the most important statistic in this is that levee on the south side of the riverbank, the one that separates the river from the main part of the city, from the central business district, is 11 m high. 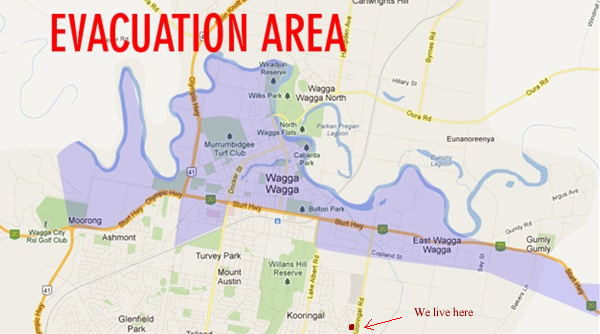 So last night, at about 9 o’clock, the SES ordered evacuation of central Wagga! They say it is precautionary – that the water won’t go over the levee, but are getting people out just in case. And the bigger issue seems to be that they are worried more about a ‘breach’ – about the levee breaking – than it being ‘overtopped’. And a breach, though the water level is lower, is more devastating because instead of a few inches of water pouring over the edge it will be a few feet of water pouring through a hole – probably eroding the bank as it goes, causing havoc to the levee and inundating the downtown. This is the area that was evacuated last night - it doesn't account for the huge, though less populated, area north of the river that was put on notice on Saturday. We live at the bottom edge. We are SAFE! We aren’t in the evacuation zone. We are a couple of kilometres south of the river, and our house is on a hill. Our neighbourhood is actually one of the ones the SES notice told people to go to for safety! But some of the roads around us are closed, and we don’t actually know right now what the roads through the city are like. We are getting what in Canada we called a ‘snow day’ – CSU closed the Wagga campus! Some of the roads going to campus are already closed, and that means that yesterday there was a lot of traffic on the main bridge out of town, so to take pressure off the roads (and quite possibly the people!) they shut down. So for now, we are watching the news, texting with friends and colleagues, and monitoring Twitter and Facebook to see what is happening. One of Lisa’s colleagues was evacuated and spent last night in a church. She and her housemate have just arrived here at the house, as a more comfortable safe haven, as we write this. Dan is out at Woolies, scavenging the grocery store shelves among the other “panic” shoppers. Gas stations are lined up around the city, with rumours of $2.50 per liter petrol. As the centre of town is evacuated, grocery stores are also now closed, so our neighbourhood is one of a few that is now feeding the city’s residents. We also know some people who evacuated out of North Wagga on the weekend and others who will have left central Wagga last night. We assume that since they have all been here longer than us, they all have places to go beyond the shelters that have been set up in schools (and the school kids are getting a snow day too, while the classrooms are mobilized as shelters). Other colleagues and friends have also taken in some of the flood’s refugees – so at least those of us who are high and dry can feel like we’re helping. A view of the drive home from work Monday, not far from the Uni. Those tree trunks shouldn't be covered in water like that! What is really weird about this situation, too, is that the weather right now is so beautiful. It is sunny and warm and the birds are singing; so, we are going to enjoy our snow day. But we can’t really venture too far from home – cycling, for example, is a bit of a challenge because most of the places we go are in the evacuation zone or were flooded out last weekend and probably still a bit dodgy for riding. And this weather pattern emphasizes that there are two types of floods: a flash flood caused by fast rain (which is what was happening to close the streets on the weekend) and a real flood, caused by rising waters downstream. And that is what this one is; and while the first kind can be horrible, they usually rise and subside quickly (hence the ‘flash’ name). This real flood, though, has people on edge for days, and if it hits the severity they are predicting it will have lasting impact. They've built an impromptu levee across one of the streets where we go biking! No, these cyclists aren't us... just crazy folks who are getting too close to the water. There are a lot of theories of water management that will be argued after the water goes down – should the dam be there, should it have been opened early to control the flow better, etc…this is all being debated in Queensland right now about the 2010 floods there. But at least right now, people aren’t focusing on cause – other than nature dumping a hell of a lot of water on us in a short time – but instead focusing on keeping people safe and trying to minimize damage. So, for all the people who have been asking about us, who have heard about the situation here, we want y0u to know that we are fine. Thank you for your concern, but rest easy! Our city, that we have grown to really enjoy, is possibly about to be devastated, but we are safe. We are worried about the potential impact though. Many of our favorite places are in jeopardy: Three Chefs restaurant, Knight’s Meats butcher/deli, Kidson’s Cycles are all right on the river. Thirsty Crow, Duffy Brothers Fruit and Vegetable, Blake Street Butcher…all on the flood plain that could be several feet deep by tonight. We’ll keep you posted as things unfold. In the meantime, you can also keep up to date by checking out the Daily Advertiser or (keeners!) following NSWSES Facebook and #Waggafloods Twitter feeds; here is a link to some of the tweets, captured by the local paper. 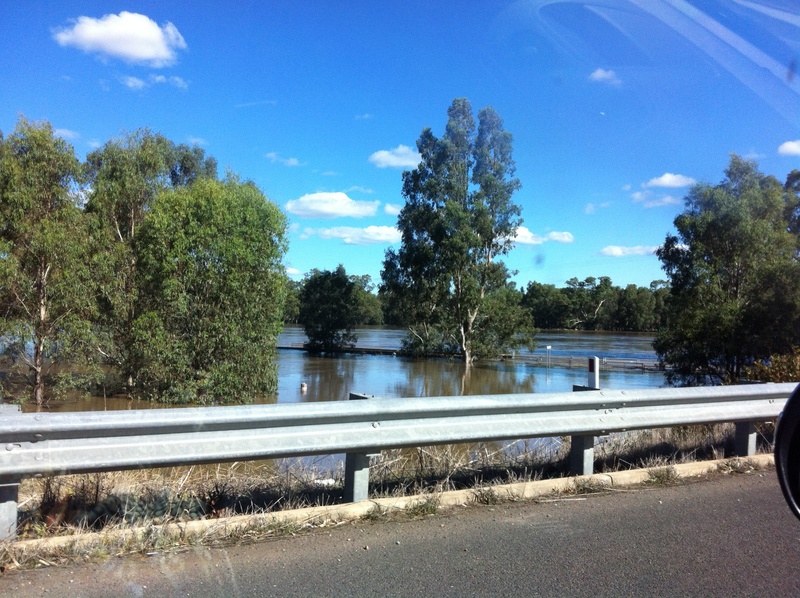 This entry was posted in danger, floods, Murrumbidgee, Riverina, wagga, wagga wagga, weather. Bookmark the permalink. So glad to hear that you are safe! Take care! stay dry and safe….good to read your news!